And with that in mind, we are introducing the SCALE Method. We use the SCALE Method to help you identify and address the issues newly funded startups need to address to successfully scale. Hiring, project management, order fulfillment, and even document storage, are just some of the areas that must be streamlined and running like a well-oiled machine in order for your startup to be able to focus on growth and scaling. One of the top reason most startups fail is running through cash too quickly, usually through expenses and poor buying decisions. We help you figure out the best, most cost-effective ways to complete tasks and projects, so you don’t run out of money. Connecting with investors, board members, and mentors is crucial to giving you the financial and operational support you need to succeed. But so is conducting due diligence on these folks. We help you figure out the support you need, and then make sure that your candidates are the right fit. Identifying the need of your target market is crucial so that you are solving a problem caused by these pain points. However, you also need to determine proof of concept by making sure that this is a pain point that your market wants solved. A corporate culture where everyone is working toward the same goal is imperative. Developing a strong mix of autonomy and collaboration, as well as allowing everyone to work in their genius, helps productivity skyrocket and keeps your team happy. 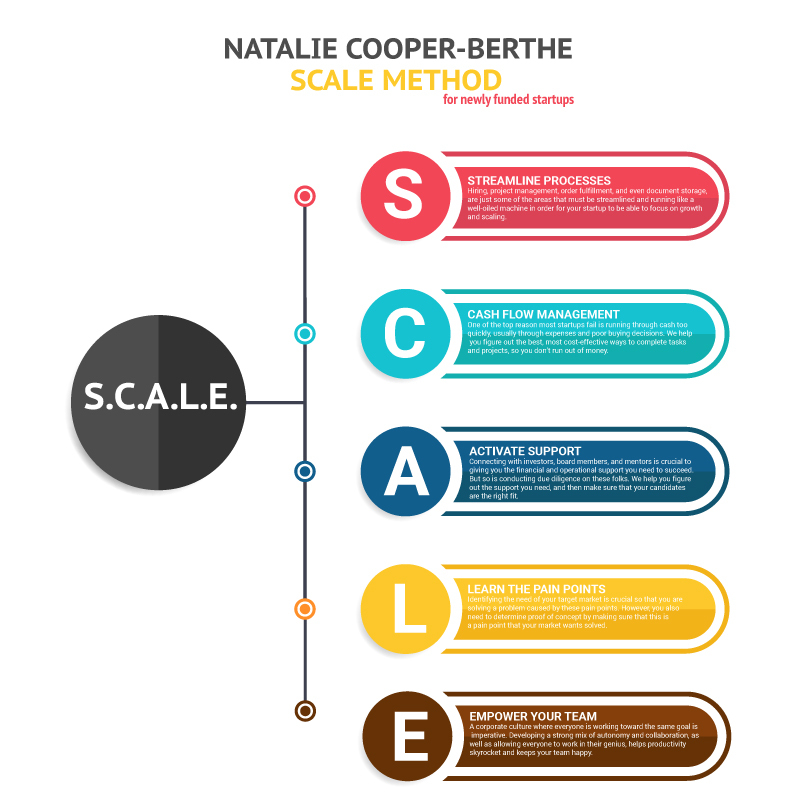 You can learn more about the SCALE Method and review some case studies here. Or apply for a free consultation here.